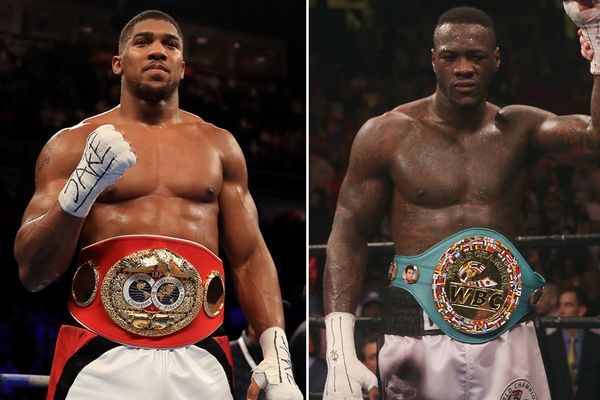 Wilder vs. Joshua: Make It Happen! Briggs Seekins April 30, 2018 Boxing, Headlines No Comments on Wilder vs. Joshua: Make It Happen! Last weekend, Eddie Hearn and Matchroom Boxing invaded Brooklyn. The English promoter has become one of the sport’s major players in the past couple of years. At the Barclay’s Center he presented a great card, headlined by elite middleweight contender Daniel Jacobs vs. undefeated Maciej Sulecki of Poland. But the collected boxing and sports media wanted to pigeonhole Hearn on just one topic: Is Anthony Joshua going to fight Deontay Wilder or not? At the end of last week, the undefeated Wilder took to social media and declared that he had $50 million dollars on the table, waiting for Joshua, if only the undefeated Brit would sign on the line for a fight. Let’s be clear: Offering $50 million on social media is not the same thing as producing a valid contract for a fight. There is indeed an air of posturing to all of this. But at the same time, it’s not hard to believe somebody out there might be willing to put up that kind of money to guarantee Joshua’s participation in such a bout. Wilder himself has yet to make much more than 2 million for a fight, but he is coming off from the knockout that proves he is legitimate–a sensation stoppage of Luis Ortiz in March. Joshua is already a major attraction in England. Between box office potential and likely pay-per-view sales in England and the Unite States, a $50 million guarantee for Joshua is not a major gamble. This fight will make money. Boxing fans have been waiting a generation for a bout like this–two big, athletic, undefeated heavyweight punchers from opposing sides of the Atlantic. Boxing just doesn’t get better than that, at least not on paper. I caught Hearn interviewed over the weekend by Gerry Cooney and Randy Gordon on Sirius 93’s At The Fights show. He was non-committal about specifics but seemed to understand that this is a fight that needs to happen. Most encouraging to me was that he acknowledged the need to make this fight happen while Joshua and Wilder were both in their primed, unlike with Floyd Mayweather and Manny Pacquiao, which “marinated” for years and ultimately happened much too late to have true historical importance. So let’s hope that logic and decency prevails. Let’s hope we have a major, heavyweight unification clash before 2018 draws to a close.